Large stock of Cylindrical Silencers for quick shipment. Reusable Thermal Blankets, Elbows, Surge Tanks, Rain Caps & Bonnets, Wye & Flex Connectors, Bellows, Brackets, Flanges, Clamps, Nuts, Bolts, & Gaskets, Spark Arrestors, Tubing & Fittings, Expansion Joints, Roof & Wall Thimbles. SMS has been manufacturing State-of-the-Art exhaust systems since 1992. Extensive engineering department capable of in-depth acoustical, mechanical, thermal, and emissions analysis plus system design, fabrication and installation. Their unique Compact Silencer design allows you the capability of providing optimum sound attenuation in the smallest package. Customer's find that it is typically 1/3 the size of a standard cylindrical (hot dog) shaped silencer. 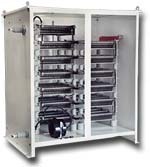 Starters: AC & DC Voltages or Hydraulic driven, and EXPLOSION PROOF, Alternators & Motors: AC & DC Voltages, and Explosion Proof. Replacement Starters and Contactors for most GE and Solar Turbines. High quality Fuel Polishing systems and engineered DEF complete supply equipment. Integrated fuel pumping and monitoring systems. Heavy Duty Spring Isolators for: Diesel Generator Sets, Power Units, Pump Packages, Compressors, Heavy Industrial Equipment, Turbines, and Marine Engines & Equipment. 5KV & 15KV Automatic Transfer Switches & service entrance rated, Area Protection & Co-Generation Panels, Instrument, Relay, Mimic, Marine, Cogeneration Controls & Load Sharing Gear, Custom Blower & Motor Control Centers, ENGINE & TURBINE CONTROL PANELS. Many varieties of Neutral Grounding Resistors, Neutral Grounding Reactors, and High Resistive Grounding, High Resist in addition to Disconnects. Harmonic Filters & Damping. 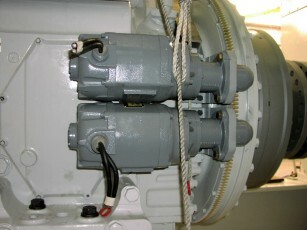 Surge Arrestor Assemblies, and Bolted Pressure Switches. 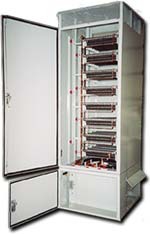 Custom Resistive & Reactive Load banks. Very quick delivery times. Custom sizes & designs are available. Disconnect Switches; Knife Switches, Medium Voltage Switches. Motor controls, AC & DC Controls. Bolted Pressure & High Current Switches, Crane Controls, Fuses & Fuse Blocks, Bus Bar Disconnects, Resistors. US Energy Explosion Proof Engine & Turbine Starters are in use throughout the World in Hazardous locations on Land, Platforms, or Ships........Think of Com-Fab for your Trailer & Enclosure needs!............Filnor produces a large variety of Resistors & Neutral Grounding Resistors.